Every once in a while, I take a break from the indie rock 'n roll lifestyle and slow down for a nice evening with Mom, like I did last year when I took her to see Lang Lang at Carnegie Hall. Last night, met up with her after work for her delayed Mom's Day gift -- a fancy dinner at DB Bistro Moderne, followed by some jazz at Town Hall featuring two saxophone greats, Branford Marsalis and my long-term love, Joshua Redman. 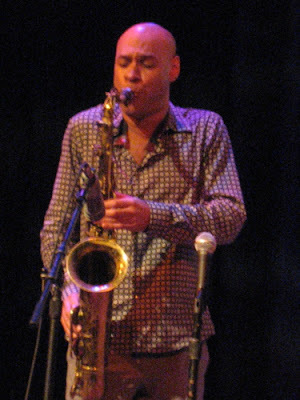 I was obsessed with Joshua Redman back in my early twenties. I went through a real jazz phase during my college years during which I collected many of the dead greats, so it was refreshing to catch someone only a few years older than me playing with such a dynamic vibe, and not in that cheesy smooth jazz kind of way. And because of his collaborations, I've branched off and also followed the music of the likes of Christian McBride and Brad Mehldau. 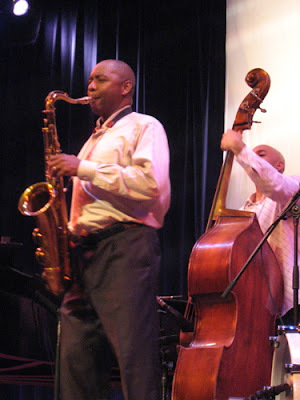 I've seen him in a variety of venues over the years -- the most memorable being the teeny tiny Blues Alley in DC. I was so miserable in my first year of law school that Fall of 1996, I went solo to this spendy jazz club to cheer myself up, and ended up talking to Joshua after the set. He was really friendly and appreciated the drink I bought him at the bar. I dug him so much that I had him autograph my copy of his CD at the time. Yes, uber-dork! Anyway, the last time I saw Joshua in concert was in Spring of 2001, again with Mom, and I pretty much stopped following him shortly thereafter for no good reason. Mom and I have occasionally ventured to a jazz gig together over the years, including a fun weekend at the Newport Jazz Festival in 2004, but we never caught up with Joshua again, till last night. 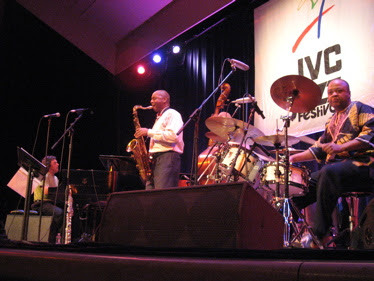 When I saw a few months ago that Joshua Redman would be opening for Branford Marsalis as part of the JVC Jazz Fest, I pounced on tickets when they went on sale, and grabbed a very nice pair in the 4th row. For this latest iteration of Joshua Redman, he is working as a trio, with the excellent Reuben Rogers on bass and Eric Harland on drums. It was wonderful seeing them nice and close and in a relaxed format, where I didn't have to worry about the elements or a waitress pestering me for a two drink minimum. His set lasted about 50 minutes, and focused on cuts from his latest release, Back East, including a beautiful eastern, almost gypsy-esque song called "Zarafah" dedicated to his mother. I particularly dug the Theolonius Monk cover "Trinkle Tinkle." 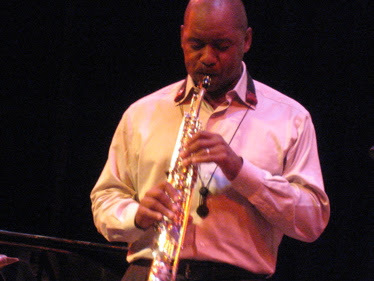 Next up, Branford Marsalis. Maybe because I've been spoiled by the last two times I went to Town Hall (for Bright Eyes and for Feist) during which I sat in the front row, I felt compelled to improve our seating. When I passed by the ticket scalpers before the show, I noticed they were hawking tons of front row seats. And surprise, surprise, many of them remained unoccupied, so I seized upon the opportunity and moved us up front. Mom was skeptical and afraid we'd be busted, but she doesn't know she's got Qbertplaya for a daughter. Branford expanded upon Joshua's trio format with the addition of a piano, which lended itself quite nicely to the other Thelonius cover of the evening. He is a skillful bandleader, often dropping downstage to allow his bandmates to do their thang. I especially liked sitting in front of Jeff "Tain" Watts, who is a powerful drummer. Branford and his mates finished after about 75 minutes. I still preferred Joshua's ability to let loose, but overall a great show. Mom appreciated the present, and I bet she understands now a little better about what it is to be a Qbertplaya.